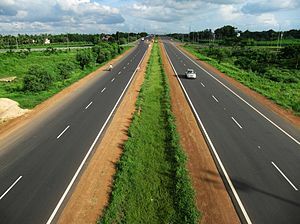 The Kanpur-Lucknow National Highway (NH 25) near Jajmau. 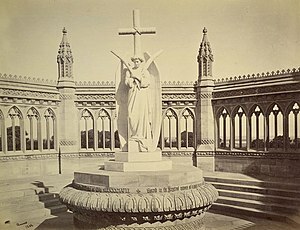 Kanpur spelled Cawnpore before 1948, is the Industrial Capital of Uttar Pradesh and is the administrative headquarters of Kanpur Nagar district, Kanpur Dehat district and Kanpur division. It is the twelfth-most populous city in India and the major industrial hub with in the state of Uttar Pradesh. It is one of the oldest industrial townships of North India. It has a metropolitan area of over 1,640 square kilometres (630 sq mi) and a city area of around 829 km2 with an approximate population of 3 million inhabitants in its area. It is administratively divided into 6 zones and 110 wards with an average ward population range of 19000 to 26000. Over the past years, the city has developed to an important centre of textile, leather, electronics, chemicals, food processing, automobiles, communication, real estate, information technology, aerospace, engineering and heavy industries. The city has also developed to a major infrastructural city in the past years. Many Shopping Malls, Multiplexes, Real Estate Townships, Company Offices have been developed. The city also specialises for single-story houses. About 50% of City residents live in single-story houses. One of the biggest metropolis of Uttar Pradesh, Kanpur, acquired a place on the map of India only in the modern era after the advent of British rule. The local army of Oudh under the British Command which was stationed at Faizpur, near Bilgram, under the terms of the treaty of 1773, was moved to Kanpur in 1778. The simple reason was that of East India Company realizing the advantageous position of Kanpur, wanted to establish commercial firms there, and therefore decided to have the protection of the army for the British traders and their establishments. Henceforth, Kanur became an army camp, or ‘Kampoo’ as it was referred to in the colloquial terminology. The presence of large army garrisons gave rise to demand for variety of goods, particularly food-stuffs, clothes and leather articles.9 Consequently it grew into an industrial metropolis. It had the advantage of growing into an industrial city especially inn the period of second world war, as there was ample market for the war material, shoes, saddles etc. It may be further noted that till 1778 Kanpur was merely a village. With the network of railways laid in 1863, it assumed far greater importance from the point of view of trade and industry. Also, it gained importance due to its central location in the Indo-Gangetic plains, and presence of river, canal and host of other facilities encouraged the leather and textile industries. The first textile mill was started in 1861. By 1891 it became quite an important industrial centre. Now it is the nodal industrial centre of the state. Jute, leather, textile, defence (aircrafts and ordinance), rolling mills, and host of other industries are developed here. Originally a military cantonment at the border line dividing the then British frontier from the province of Oudh and the territory of the Moghal Kings of Delhi, it has become one of the most important industrial centre of the country. Before the national uprising of 1857, the cantonment covered an area of about 28 Sq.km. stretching along the river front. The main city was enclosed by the cantonment on three sides and city’s expansion was possible in one direction only inn the triangular space enclosed by the GangaCanal in the east and the cantonment boundary in the north and west. This naturally resulted in great congestion in the main city. After 1857 many industrial concerns were established at Kanpur. The city had already become famous for tanning and curing of leather and for the production of leather goods, especially of boots and saddlery for the military. The period 1863-1885 witnessed the development of great industrial establishments, i.e. the Government Harness and Seddlery Factory, Coopar Allen & Co., North West Tanneries Ltd. And several cotton mills like Elgin, Muir, Victoria, Kanpur Woolen Mills and Army Cloth Manufacturing Company Ltd. Etc. (2) in the south of the city proper. Lately the city is expanding towards south beyond the railway colony. The city proper is crowded and some of the old built-up areas have developed into virtual slums separated by narrow lanes. The Mall is an old market serving the city as well as the cantonment. Nayaganj is the largest grain market. With a view to providing better accommodation, Open market of Collectorganj, now the centre of grain trade lies on the chowk road which is a narrow lane lined with shops and business houses running west to Collectorganj. Thus industry dominates all spheres of life in Kanpur. It has become an important centre of advanced education including technical; the IIT has added a new township to the city. Kanpur is believed to have been founded by members of the Chandela dynasty from the state of Sachendi. The city’s name is believed to derive from Kanhiyapur (from the Hindi meaning “town of Kanhaiya”). During the British Raj, this was anglicised to Cawnpore. In old British maps it is also listed as Khanpur. Others believe that the name is derived from Karnapur (meaning “town of Karna”, one of the heroes of the Mahabharata). Another theory is that it came from the nearby town of Makanpur, earlier known as Khairabad, where the Sufi saint of the Madariya Sufi order, Badiuddin Zinda Shah Madar, settled. The new district of Kanpur Dehat from the old Kanpur Rural district. Kanpur, along with Allahabad and Fatehpur, are part of the Lower Doab, which in antiquity was known as the Vatsa country. It is surrounded by two main rivers of India, the Ganges in the northeast and the Pandu River (Yamuna) in the south. 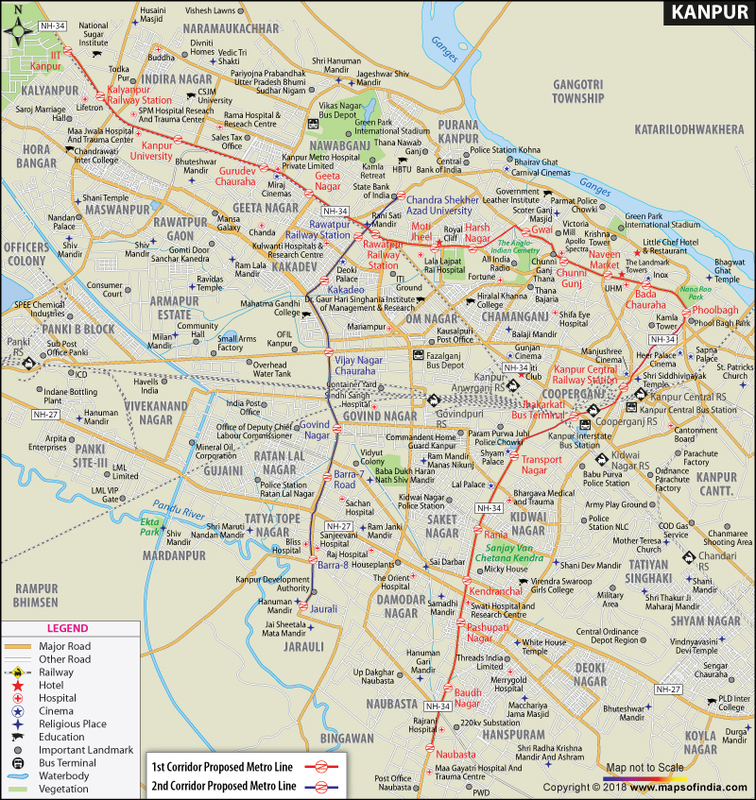 The districts surrounding Kanpur are Hamirpur in the south and Unnao in the north-east. The arid region of Bundelkhand lies just south of Kanpur. Kanpur district along with Kanpur Dehat district lie between the fertile Doab region of the Ganges and Yamuna rivers. The river Yamuna marks the boundary between the Avadh and Bundelkhand regions. Kanpur City comes under the Indo-Gangetic planes of India. There are facilities of clean drinking water. Water comes from Kanpur City by Ganges Barge and there are various pumping stations for providing water to Farmers for crops. Kanpur is situated on the left side of river Ganges and right side is Shuklaganj which is in Unnao District but is also the part of Kanpur. Kanpur features an atypical version of a humid subtropical climate that resembles the climate of Delhi to some degree. Unlike many other cities with a humid subtropical climate, Kanpur features long and very hot summers, mild and relatively short winters, dust storms and a monsoon season. Kanpur lies in northern plains of India, which witness extremes of temperature. It can drop to a minimum of 0.0°C in the winters while it goes up to 48°C in summers. Kanpur experiences severe fog in December and January, resulting in massive traffic and travel delays. In summer excessive dry heat is accompanied by dust storms and Loo, traits more commonly seen in desert climates. Rains appear between July and September almost at the end of regular monsoon season. Some rainfall is recorded during the harvest season of March–April. These extremes however, give the region an advantage of having three crops of versatile range of products. Best time to visit Kanpur is either October–November or February–March.Snowfall has never occurred in the city. There are some times Hailstones accompanied with rain in the winter season during the month of January but sometimes Hailstorms have also occurred in the months of March and April.In January 2002,the city witnessed a heavy hailstorm which left the city streets white with ice pieces and recently in 2009 when the last hailstorm was recorded. Dust storms are frequent during the months of April–June.These dust storms are sometimes accompanied with light drizzles. Such dusty winds raise the level of particulates in the atmosphere resulting in severe air pollution and increasing health hazards. Sometimes the speed of winds exceeds to more than 100 km/hr in the outer areas of the city. Kanpur City lies on the right bank of the river Ganges, which is elevated very high from the river, which is the reason that the city never floods. Some of the rural outskirts of the city lie on the flood prone areas of the Ganges, and it often floods the villages on its banks during the monsoon season.The Left bank sandy areas on the banks of the Ganges are cultivated to produce summer fruits like Watermelon.The dry and Hot Loo winds help the growth of watermelon which results in its great yield.The average rainfall recorded in the city is 885 mm.